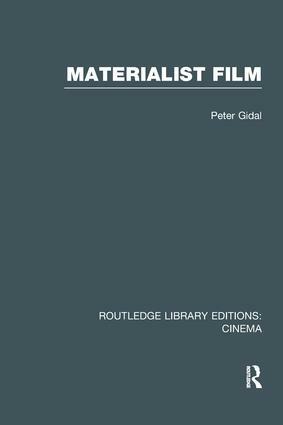 A polemical introduction to the avant-garde and experimental in film (including making and viewing), Materialist Film is a highly original, thought-provoking book. Thirty-seven short chapters work through a series of concepts which will enable the reader to deal imaginatively with the contradictory issues produced by experimental film. Each concept is explored in conjunction with specific films by Andy Warhol, Malcolm LeGrice, Lis Rhodes, Jean-Luc Goddard, Rose Lowder, Kurt Kren, and others. Peter Gidal draws on important politico-aesthetic writings, and uses some of his own previously published essays from Undercut, Screen, October, and Millennium Film Journal to undertake this concrete process of working through abstract concepts. Originally published in 1989.